Today was Day #4 of Chocolate and Spicy Pepper Theme Week. 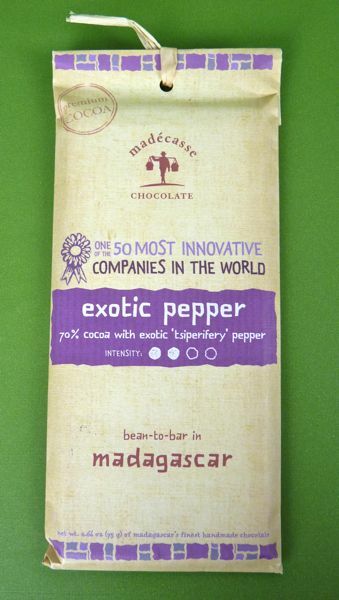 If you want to experience some of the more beautiful flavor notes from pepper -- without the hot spots or grit of most commercially available freshly ground peppercorns -- then I highly recommend trying this 70% cocoa Exotic Pepper bar, made with tsiperifery pepper (and pink and black pepper) from Madecasse Chocolate (Brooklyn, NY). Madecasse is one of a handful of chocolate makers developing bean-to-bar offerings in Madagascar -- closer to where cacao beans are grown. Most chocolate bars are made in North America, Europe, Asia, or elsewhere -- closer to the brand origin vs. the cacao origin. The hope is that developing closer relationships with farmers and those involved in the initial processing of cacao in-country may result more local jobs and better chocolate.